I’m just back from SVPCA 2010 (the Symposium of Vertebrate Palaeontology and Comparative Anatomy), and what an amazing meeting it was. I think it was the best I’ve been to. That’s partly because I understand more of the talks these days — it’s the first time I’ve ever listened to every single talk, even all the mammal-tooth and fish-skull talks — and I learned something interesting and new from almost every one of them. But as is so often the case, the best thing about the meeting was, well, meeting. I met with Matt and Darren for the first time in a year, which is always excellent. And for the first time, I met horizontal-sauropod-neck advocate Kent Stevens. 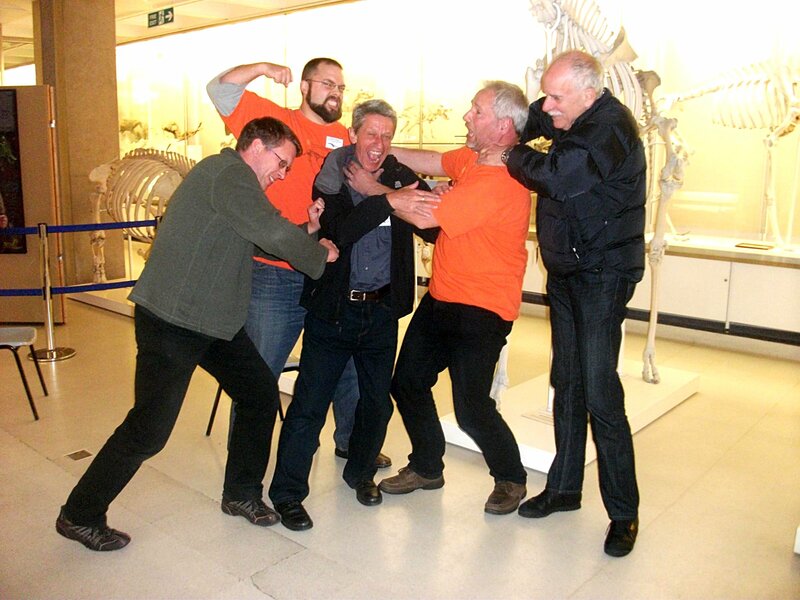 Kent was there to present one of two talks on horizontal necks, and UK sauropod jockey John Martin presented the other. Their talks were part of a block of seven sauropod talks — it would have been eight had Michael Pitman not changed his scheduled sauropod-tail talk to a theropod-tail talk. Matt and I both made presentations, although Darren wasn’t able to because he didn’t know that he’d be able to come to the meeting until the last moment. 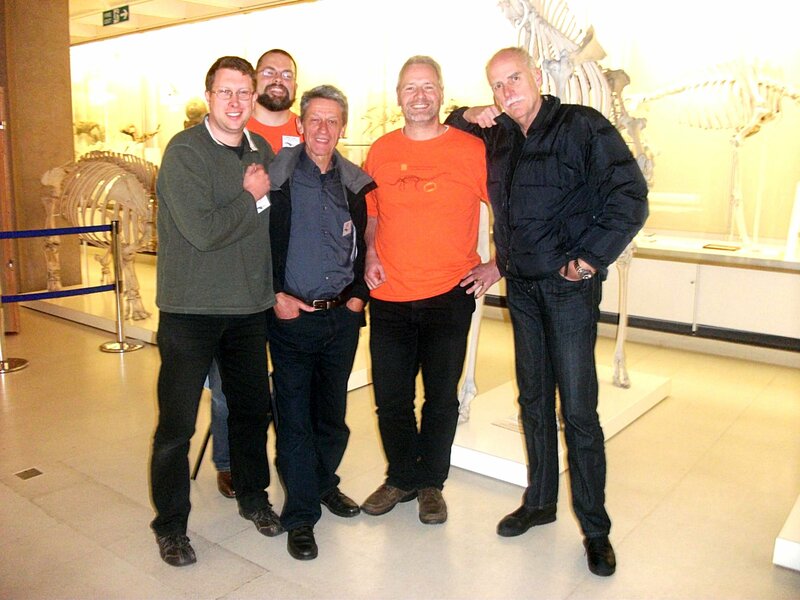 Sauropod Neck Posture Working Group, 2010 meeting. From left to right: Darren Naish, Matt Wedel, John Martin, Mike Taylor, Kent Stevens. As you can see, we were all very civilised and well behaved. The Sauropod Neck Posture Working Group carefully considers all points of view in a detached, professional and mature manner. The case for horizontal or near-horizontal habitual pose rests on two assumptions. First, that osteological neutral pose (ONP) was habitually adopted; and second, that we can know what ONP was. We still feel that both of these assumptions are false. We can’t know ONP because there is not a single sauropod neck skeleton anywhere in the world consisting of undistorted cervicals — and even if we knew what ONP was, it wouldn’t tell us much about what I am suddenly going to call mechanical neutral pose (MNP)[*], because we don’t know anything about the intervertebral cartilage. And we know that extant animals do not habitually adopt ONP because we have X-rays that show us how they habitually rest, and we know that they don’t match what you get by articulating bones. 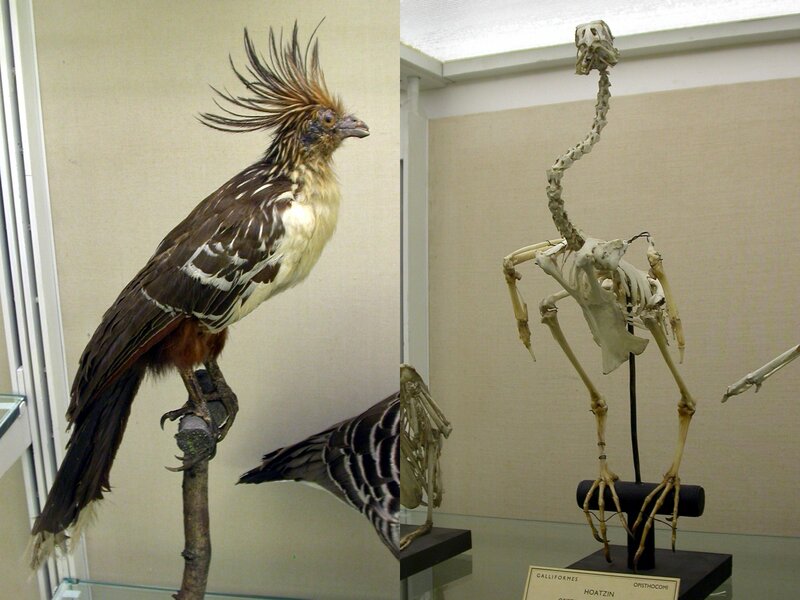 Hoatzin (Opisthocomus cristatus), stuffed specimen and skeleton. 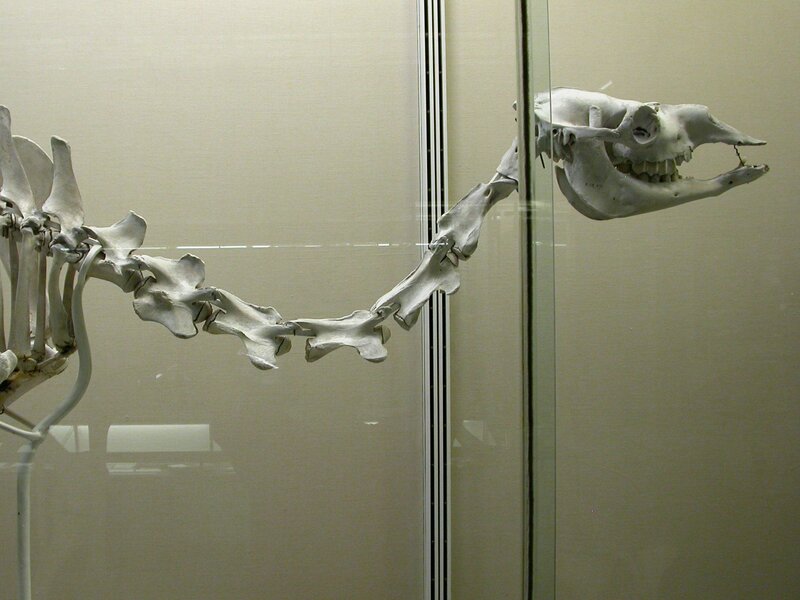 Note the extraordinarily long cervical skeleton, almost entirely unreflected in the live animal. Head and neck of dromedary camel (Camelus dromedarius) UMZC H.14191, in right lateral view, with disarticulated C3/C4 and C4/C5 joints. Notice how very dramatically the third and fourth cervical central fail to contact, and the fourth and fifth. How uncomfortable this must be for the poor camel — its neck extended (or “dorsiflexed”) far, far out of ONP, to the point where the vertebrae drastically disarticulate. And yet we all know perfectly well that habitual pose for camels is much more extended than this, and many of us have seen photos of camels leaning their necks right back so that their heads are upside down, and they can rub the top of their head against their back. Just imagine what that does to the cervical articulations. More on this subject another time. For now, I leave you with more from the Sauropod Neck Posture Working Group summit. errm.. I’m with you guys on the neck posture question (or at least your reasoning and evidence – since we don’t have live sauropods or ones guaranteed preserved in real-life poses)..
but I’m perplexed by this museum-mount of a camel’s neck. In the museum mount, the zygapophyseal articulations (apposed as closely as possible) seem to have been used as the very basis for vertebral relative positioning! Ignoring the position this leaves the poor centra in..
Armadillozenith, it seems clear that museum wanted to mount the neck in habitual life posture, and that in order even to approach that posture they found it necessary to grotesquely disarticulate the centra. Even then, they were not able to get particularly close to the actual life posture, in which the neck attains an attitude far closer to the vertical — presumably whoever was responsible for the mount couldn’t bear to pull the centra even further apart. I will buy a pint of finest British ale for anyone who can supply me with an X-ray of a camel’s neck in vivo. The hoatzin (contrast) is AMAZING..
is it the case that in many birds’ the neck’s soft tissues (by their relative shortness and limits of their stretchiness) prevent their cervical vertebrae ever attaining ONP? Also I’m intrigued to know what those other skeletons on view are, especially the one behind Darren whose head is obscured (the skeleton’s, not Darren’s). I hoped to find out from the museum’s website but haven’t been able to. Good idea, Mike! It would really help to know how far the apposed zygapophyses can move, relatively. A llama,alpaca, etc, could be similarly illuminating – probably easier to manage than a camel.. I don’t really know the answer to that, but it must surely be the case for the hoatzin, and also for the budgie featured in the Necks Lie post. How broadly that is true, I couldn’t say — nor what the evolutionary advantage is for these birds to have such long, bent necks. Anyone? The animal whose head is obscured by Darren is a hippo. It’s notable that, for a museum with just glorious exhibits, the web-site is horribly lacking in photos. Shame. I would pay good money for a set of camel cervicals. Unfortunately, while I do not disagree with your premise on its face, just details you use to get there, this post doesn’t help your case. The talks presented at SVP do not assume that animals assume ONP habitually, but that ONP is closer to the median, “active” posture. Your argument (your paper) talks right past this by arguing about “alert” posture, which is hardly the same thing (especially since you barely even define your usage in the paper). Neither your comparison of the hoatzin or the camel necks are satisfactory. I would actually try using radiographic analysis of live animals if you want to make a contrasting comparison. Both skeletons are mounted by disassembly of the skeleton into a posture without using a radiographic or live “skeletal” model to compare. One could easily claim that the only reason the camel neck is like that is because the mounter articulated the neck with the purpose of placing the zygapophyses (and only those) into clean, 100% overlap. Both an extreme centrum and extreme zygapophyseal contact likely did NOT reflect how the neck bones would articulate in a “static” posture. Kent also makes a point (as far as his abstract goes) that there are different postures for different habituses, and this is followed by Christian and Dzemski (the former representing the *Euhelopus* paper for SVP) in which the neck would likely have not been able to exceed a certain height due to stress on the vertebrae, calculated between vertebrae, and these propose neck postures well below the swan-like mounts of GSP or the snorkeling Brachios of the early 20th Century. Having a neck posture vary in attitude depending on habit may also vary among species, imply no “true way” when it comes to sauropod necks, and I tend to think Kent agrees with this, and it looks like stress analysis of various taxa show this out. It also stresses the different designs in sauropod necks, from dicraeosaurids, diplodocids, brachiosaurids, titanosaurids, etc. The “shoehorn” method (everything is one way) only works from a perspective framework, and may very well be useful only as a test, but this is not how your paper puts it. The talks presented at SVP do not assume that animals assume ONP habitually, but that ONP is closer to the median, “active” posture. Your argument (your paper) talks right past this by arguing about “alert” posture, which is hardly the same thing (especially since you barely even define your usage in the paper). “Alert” here just means “not asleep, tranquilised or dead”. Think of a horse just standing around in a field not really doing anything. It doesn’t mean “vigilant”. Neither your comparison of the hoatzin or the camel necks are satisfactory. I would actually try using radiographic analysis of live animals. Yeah. And while I’m at it, I’ll take a ride on the space-shuttle. I really have no idea what point you’re making here. Given what this post (and the earlier series) said about it being impossible to attain the life posture with just the skeleton, it seems there must be more to the picture of stresses than just what can be determined from bones. Do we really not know anything about the intervertebral cartilage? Haven’t a few articulated necks been found? Surely the gaps between were cartilage. I wouldn’t want to wager a lot on the gaps between vertebrae in articulated necks. Bones shift easily. Even in necks that are close to perfect, a highly extended death pose is often adopted which may not have been attainable in life (as alluded to in some of Kent’s earlier SVP abstracts). The only neck I’d trust to give real information on sauropod intervertebral cartilage would be one with such extraordinary preservation that the cartilage itself is preserved. And since there’s no reason to expect such a specimen to pop up any decade soon, we’re going to have to rely on more indirect lines of evidence. A good start would be comprehensive descriptions of the intervertebral cartilage of crocs and birds. But that’s not as straightforward as it sounds, as Matt has discovered in his as-yet unpublished work. Kent also makes a point (as far as his abstract goes) that there are different postures for different habituses, and this is followed by Christian and Dzemski (the former representing the *Euhelopus* paper for SVP) in which the neck would likely have not been able to exceed a certain height due to stress on the vertebrae, calculated between vertebrae, and these propose neck postures well below the swan-like mounts of GSP or the snorkeling Brachios of the early 20th Century. Andreas Christian has coauthored research on the stress distribution in the vertebrae which suggests that the neck of Giraffatitan (though not Diplodocus was held vertically. More precisely: in the slight S-curve in which the Giraffatitan skeleton in the museum in Berlin is now mounted; the cervical ribs were under tensile stress, he thinks. The abstract is long, but it certainly does not contain the variable “vertical” in it, and this is reinforced by the other work both authors have penned on the topic. Christian, A. & Dzemski, G. 2007. Reconstruction of the cervical skeleton posture of Brachiosaurus brancai Janensch, 1914 by an analysis of the intervertebral stress along the neck and a comparison with the results of different approaches. Fossil Record 10(1):38-49. 70 degrees, at the maximum, is below the vertical (unless I miss my math), and the authors indicate it was simply a maximum the stress would allow. Is it the median assumed attitude? Unlikely. Limits of motion are not adopted on average for general behaviors in most animals I know (nor, I think in animals Darren or Mike know). Read the paper (I unfortunately no longer have it, as it is currently on my old harddrive and I have not re-acquired it, or I’d point out the relevant passages), but it is clear that the limits cause the neck to undergo stresses differently than a median posture (the authors argue the walking posture (which Christian further suggests would have been adopted regularly while feeding) would have been LOWER than the maximum by a not inconsiderable amount. It is further worth stressing (ha ha) that to paint all sauropods with an equivalent brush, as to paint all animals with one for a specific point, is a fallacy that Christian and Dzemski have in several papers and abstracts shown to be false; different sauropods had different levels of stress according their maximum neck heights, and this ignores the length of the neck. Euhelopus zdanskyi has a fantastically long neck, proportionately longer than in Brachiosaurus brancai (compared to the dorsal series, and possibly a component of the total length, unknown in the former), but it had stress limits only permitting a lower height. This indicates that simply using long necks in sauropods to force the neck into an attitude at or around 45 degrees (as in a previously mentioned paper as being an average affirmed by radiographic studies of living animals) is simply, and inarguably, wrong. I asked Matt many years ago about assessing stresses in things like Sauroposeidon proteles, loading in vertebrae in sauropods, and the relation of laminae to loading (not just to diverticulae). This would allow testing the premise of the verticality of necks (in any posture) on an individual vertebral level. It took almost ten years to get a study to start doing this, and I wonder now why we are still trying to do things like visually “fitting” vertebrae to do this stuff, when the testing models need only go so far as FEA and Christian’s method? The problem is that “alert” and “vigilant” are near synonyms. If it’s not tranqed, sleeping, or dead, is it feeding? Certainly. Horses feed with their heads below the level of their shoulders, as do cattle, and presumably Nigersaurus taqueti, so is that “alert”? When I hear “alert,” I am think standing still, head up and high, scanning or listening, and doing very little else. If so, how much time do you think a horse spends doing these two tasks, and why should the posture we want to compare across taxa measure to the one, but not the other? How does skeletal loading and vertebral posture (and articulation and soft-tissue stresses) inform on these to discern this “alert” vs “non-alert” posture? Jaime is right that the paper he cites does indicate a raised-but-not-vertical posture for Giraffatitan (“Brachiosaurus” of his usage) brancai. However, David is also right that Christian has co-authored a paper advocating a vertical neck in this animal — Christian and Heinrich (1998), the first in the series of studies of which Christian (2002) and Christian and Dzemski (2007) are successive refinements. We’re at the stage now where the 1998 paper can be ignored, having been wholly superseded by the more recent work. 70 degrees, at the maximum, is below the vertical (unless I miss my math), and the authors indicate it was simply a maximum the stress would allow. No, they don’t indicate that it’s a maximum, just an optimum. And they don’t even claim that it’s the optimum posture for minimising stress, just for equalising it along the neck. It’s perfectly possible that other postures produce lower stresses along part or even all of the neck; they will however be less equal. Altogether, Christian’s result is a much weaker one than you’re portraying it as. Is it the median assumed attitude? Unlikely. Limits of motion are not adopted on average for general behaviors in most animals I know (nor, I think in animals Darren or Mike know). As shown by Vidal et al. (1986) and reiterated in Taylor et al. (2009), many animals do indeed habitually hold their necks in maximal extension and their heads at maximum flexion. This should not be super-surprising — it’s easier to hold something still when it’s braced against a physical constraint. It is further worth stressing (ha ha) that to paint all sauropods with an equivalent brush, as to paint all animals with one for a specific point, is a fallacy that Christian and Dzemski have in several papers and abstracts shown to be false. Absolutely! And Kent has also made this point in his papers. No-one is arguing that all sauropods habitually adopted the same posture, any more than anyone would argue this of all mammals. I don’t follow that argument at all. What previously mentioned paper are you alluding to? I asked Matt many years ago about assessing stresses in things like Sauroposeidon proteles, loading in vertebrae in sauropods, and the relation of laminae to loading (not just to diverticulae). This would allow testing the premise of the verticality of necks (in any posture) on an individual vertebral level. That is the dream for all of us. We are a very long way from being able to do this in anything approaching a meaningful way, and I doubt that we will ever really be able to make it fly. It took almost ten years to get a study to start doing this, and I wonder now why we are still trying to do things like visually ’fitting’ vertebrae to do this stuff, when the testing models need only go so far as FEA and Christian’s method? Your faith in something like FEA is touching. It’s going to be a very long time before it tells us anything about sauropod neck posture, if it ever does. For one thing, FEA just doesn’t work with anything like the necessary precision on bone — see for example Jen Bright’s SVPCA presentation, which was one of the highlights of the conference. For another, we don’t have undistorted sauropod vertebrae to run it on. For another, we as yet have only the vaguest clues about the associated soft tissue. Modelling a whole neck is decades away. Perhaps you missed what I said in extension to this reply, but maybe I could have clarified that in that specific setence you replied to. The “habitual posture” of Christian and Dzemski is a vague and encompassing phrase that can include, just as “alert posture” a wide range of postures, all of which are “habitual.” I used the term “median,” however, not referring to the mid-point between the two extremes, but in reference to the behaviors, based on an average. This should imply that I am talking about habitual assumption of posture among all possible postures; the one taken the least should not be used to infer the most common, or likely, reconstructive posture, just that it is _one of many_. The only posture that is assumed more often than any other (generally between feeding and sleeping) would seem to be the posture to be under highest concern, especially the former as tested by Christian (2010). I really don’t doubt that many sauropods could reach vertical orientations for their necks. I neither agree with the premise, nor disagree with it. _It needs to be tested_. It is also clear that the orientation varies among taxa. Both Christian and Stevens get this, studied it, and tested it. Oh, I’m sorry. X-rays, and yours. I think I asked back when that paper was published that you published photographs of the live specimens in the given postures, rather than a line drawing. This is not about doubt (although when it comes to turtles, it shouldn’t be surprising to many that turtles can and will “disarticulate” their necks, especially cryptodires, during the fold into the shell). By “disarticulate,” I am refering to one of the three typical intervertebral joints becoming disengaged from its opposite on the next vertebrae; this occurs between the zygapophyses in both pleurodires and cryptodires to some degree (well-exceeding the 50% margin of separation). After all this time, I thought I’d impressed on you the very important and necessary scientific premise of not believing in your own theories. You seem to think I have this failure in my own arguments, and I do not know where this premise comes from, Mike. Have you never encountered an empirical scientist before? I am, if anything, concerned about the use of varying lines of evidence to test premises on a biomechanical nature, rather than using anecdotal and “mere” observations to base conclusions upon, or using a few lines and leaving it to others to test my premises. When dealing with the physical world of form and function, you should be using techniques that deal with form and function; know “how” and “why” rather than just “what” means you use all the tools, new and old, available. This includes, but is not limited to, FEA and the Preuschoft method. These methods are designed to study the effects of resistance and stress in a solid, something that is directly applicable to the argument of neck orientation and stress relief. We have already modeled entire skulls, individual elements of the limb, entire skeletal models, under FEA and related processes. Why you think entire-neck analysis is so far away is a severe limiter on your own study. Instead of hand-waving it away, how about jumping on this and start looking into the mathematical modeling to determine what can be known for this system, in part and in whole? Sadly BoneClones don’t offer a cheaper artificial alternative. Yes; but from the premise “it needs to be tested” we can’t leap straight to the conclusion “our current techniques allow us to test it”, as you seem keen to do. This is a matter of realism. Oh, I’m sorry. X-rays, and yours. I think I asked back when that paper was published that you published photographs of the live specimens in the given postures, rather than a line drawing. This is not about doubt (although when it comes to turtles, it shouldn’t be surprising to many that turtles can and will “disarticulate” their necks, especially cryptodires, during the fold into the shell). Excellent! Do you have references to hand for this? I’d like to read more. I should have thought of investigating turtle neck-bending before. I am, if anything, concerned about the use of varying lines of evidence to test premises on a biomechanical nature, rather than using anecdotal and “mere” observations to base conclusions upon. It’s the other way round. Observations are hard data; our biomechanical models are all supposition. It’s yet to be shown that DinoMorph works, and it’s been shown that FEA doesn’t. Our best data is what we get from watching real animals. I’m not saying that we should look for better ways to model that, but the models we have now are not getting the job done. All the achieve is to give an illusion of precision: they’re writing cheques that they can’t cash. (It doesn’t take much to scan a vertebrae as a solid mesh and apply distortion, loading, and stress analyses to it in order to determine individual vertebral loading. No, it doesn’t take much. And the results are close to meaningless. good our current techniques are going to do us. And the results are close to meaningless. We might just as well model the vertebrae as solid cuboids for all the good our current techniques are going to do us. This and the previous quote … you’re gonna have to explain this one to me. WHY is FEA “meaningless”? It would seem that you feel that “observation,” by which I assume you mean taking what you see and thus just applying it to a theoretical argument, and making the concept animal (a sauropod, say) fit previous “observation.” This is what biomechanical “supposition” does, as it deals with known modeling of hard materials and their properties. Although as any materials scientist will tell you: Garbage in, garbage out, and this is true of ANY science … your output is only as good as your input, and this goes just as readily as for you guys as it does the FEA modelers. You should note that even citing your sauropod neck study, Christian uses the original usage of the name (as I actually wrote in the post, making a point of it for you guys). This and the previous quote … you’re gonna have to explain this one to me. WHY is FEA “meaningless”? I’m sorry that I am not at liberty to explain this in more detail until the paper is out (not mine; someone else’s). All I will say for now is that we have very good reason to be very suspicious indeed of all FEA studies on extinct and indeed extant animals. Bone is not a simple material like steel. Andreas caught up with me at SVPCA and apologised for not having used the name Giraffatitan — not being a palaeontologist by primary discipline, he’d initially missed the JVP paper. Having since read it, he is persuaded by the argument, and made last-minute changes to his slides to include the revised name. For what it’s worth, the scientific staff at the Humboldt Museum where all the Giraffatitan material is held are also inclined to use the new name, although I’ve been warned not to expect the signage in the public gallery to change any time soon.